On Monday I attended an incredible all day workshop run by Lesley Charnock at her Montebello Gallery. The topic was Colour in Portraiture using acrylics or oils. This is the first attempt at applying her methods to mix flesh tones. My painting technique is very different to hers as I am tending toward a more photo-realistic approach, with smooth tonal ranges and a lot of detail. She prefers large, bold, splashes of colour and less detail. 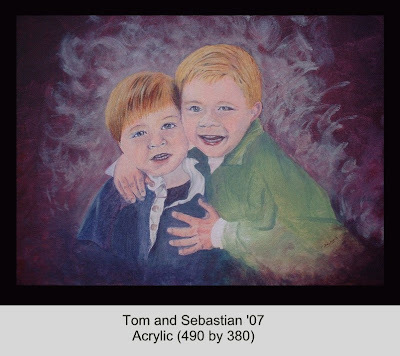 This is the first time I have painted young kids. I worked from a rather small picture e-mailed to me by my niece in America. I have never met the kids. Annie, I hope I have done them justice! Talking about colour, an interesting problem crops up in trying to accurately represent a painting in a photograph. Photographs taken in sunlight, shade, artificial light, using a flash or using different cameras all show big colour differences and seldom get close enough to the original to truly depict its appearance. Changing the camera’s white balance settings doesn’t necessarily solve the problem. I have tried to do some colour correction in Photoshop but even then the colours in the photograph are never perfect. And then, the computer monitor you use to view the photograph has an equally large influence. We do the best we can! I think this is a good first attempt. I like how you captured Thomas' plump cheeks. Perhaps a little more work on the eyes (the most difficult, I know) for both boys and you'll have it in the bag. I just read your blog frequently. Thanks for sharing your thoughts....it was a nice post.